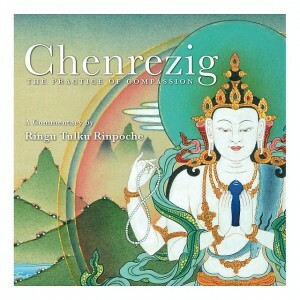 The Meaning of the Mantra by Dilgo Khyentse Rinpoche. There is not a single aspect of the eighty-four thousand sections of the Buddha’s teaching that is not contained in Avalokiteshvara’s (Chenrezig) six syllable mantra, “OM MANI PADME HUM”, and as such the qualities of the mani are praised again and again in the Sutras and the Tantras. Whether happy or sad, if we take the mani as our refuge, Chenrezig will never forsake us, spontaneous devotion will arise in our minds and the Great Vehicle will be effortlessly realized. Dilgo Khyentse Rinpoche Heart Treasure of the Enlightened Ones.